Books & blogs don’t inspire like people do and as a leading expert on innovation Cris’ keynote speaking style isn’t just inspirational it has entrepreneurial spirit! Described by one client as the David Blaine of innovation experts you won’t box this speaker in for any length of time! 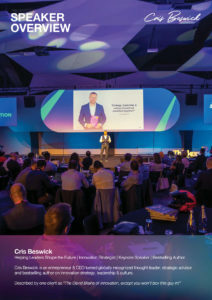 Cris provides expert comment and talks that focus on how competitive advantage and growth is delivered through building a culture of innovation. As a thought provoking, passionate yet down to earth speaker, Cris mixes inspiration and practicality for audiences from national conferences to leadership teams of global top 100 companies. As well as Cris’ own keynotes he can work with you to create organisation specific presentations, facilitating discussion around industry challenges, and business realities helping you become a smarter organisation. Cris can also chair/facilitate innovation events or conferences. Innovation Keynotes and ‘Keynote Conversations’ on subjects like: Changing the World Through Strategic Innovation; What it takes to Shape the Future, Building a Culture of Innovation and Why Strategy, Leadership & Culture Should Eat Breakfast Together!